Experts said Jahvon Goodwin could not control himself when he killed a stranger. Would the jury believe them? Pauline Barnes, whose son was fatally stabbed by Jahvon Goodwin, consoled her daughter in Suffolk Superior Court during the 2015 murder trial. This story was written by Maria Cramer. It’s easily the most well-known collision point between mental illness and American justice: when a defendant claims insanity to fight criminal charges. It is also a telling crossroads of legal interests and social priorities, underscoring how ill-suited courtrooms can be for sorting out complex psychiatric issues and how reluctant the system can be to take full account of mental illness as a mitigating factor. A Spotlight Team review shows the insanity defense is rarely used and even more rarely successful. Even in cases when the testimony of psychiatrists is unanimous that mental illness, rather than intent, best explains a defendant’s alleged crime. And especially when that crime is murder. The story of Jahvon Goodwin offers a clear example. On an August afternoon in 2012, Goodwin was in the back of the No. 23 bus bound for Roxbury, sitting near another passenger, a stranger to him. As Goodwin stared ahead silently, Rashad Lesley-Barnes, a 24-year-old hospital orderly on his way to work, chatted happily on his cellphone. When Lesley-Barnes brushed Goodwin’s leg as moved to get off the bus in Dudley Square, Goodwin stood and followed. He trailed Lesley-Barnes for a few steps, then attacked, swiftly and repeatedly driving a knife into his neck. Lesley-Barnes staggered across the street and collapsed on a folding table where some men were playing chess. “Please, don’t let me die,” Lesley-Barnes begged EMTs as Goodwin, a 20-year-old high school dropout who had been diagnosed with schizophrenia a year earlier, ran away. By the time police found Goodwin a week after the ultimately fatal stabbing, he was lying on his side in a Lynn psychiatric hospital, a blanket covering his head. He said he could hear voices everywhere — coming from the television, the radio, even the air conditioning vents. Pauline Barnes touches a photograph of her son, Rashad Lesley-Barnes, during a vigil commemorating the anniversary of his death in 2015. Lesley-Barnes was stabbed to death by Jahvon Goodwin, a stranger who was riding the same bus. At the criminal trial that followed, enormous attention and resources were devoted to determining whether he was insane at the time of the killing. The defense and prosecution spent a combined $34,000 on doctors who examined Goodwin. Two psychiatrists, one initially hired by the prosecution, testified that Goodwin could not control his actions that day. Prosecutors didn’t present a mental health expert during the trial. The jury found Goodwin guilty of murder anyway. “I was actually surprised at how little faith [jurors] put in the doctors’ testimony,” said one juror, a 31-year-old engineer who asked that his name be withheld to protect his privacy. The outcome should not have been surprising. Insanity defenses fail at least two-thirds of the time, studies show. A Spotlight Team analysis of records provided by the 11 district attorneys in Massachusetts found that defendants successfully pleaded insanity about 460 times in criminal cases between 2005 and 2014. That’s a minuscule proportion of the approximately 2.2 million criminal cases that came through the state’s district and superior courts over the same time period — and it includes successful insanity pleas for nonviolent offenses such as illegal cutting of trees and disorderly conduct. *Note: Worcester County did not provide complete accounting of all verdicts. In murder cases, where the stakes are highest, judges or juries rejected the insanity defense 37 times over the decade, while accepting it just 14 times, for a success rate of 27 percent. But, perhaps more striking, numerous murder defendants with mental illness chose not to pursue an insanity defense: 34 either pleaded guilty to a lesser charge or went to trial without claiming insanity. Only one was acquitted. Defendants, no matter how ill, have the right to reject an insanity defense. When they don’t, defense lawyers said they may still recommend clients take a deal that comes with prison time rather than take their chances on an insanity defense at trial. In 1998, Michael Pepper, a young chemical engineer, accepted a 24- to 26-year sentence for killing his parents. In the days leading up to the killings, he had stopped taking antipsychotic medications, and a doctor who examined him said his illness severely affected his ability to tell right from wrong. But his lawyer, Michael Hussey, recommended that Pepper accept the prosecutors’ offer of a long sentence, rather than risk a jury trial that could have led to life behind bars. Prosecutors, meanwhile, are often under enormous pressure from the public and families of grieving victims who want severe penalties. Because an insanity plea requires defendants to show they couldn’t control themselves or tell right from wrong at the time of the killing, prosecutors can acknowledge that the defendant is sick — just not sick enough to excuse a murder. Suffolk District Attorney Daniel F. Conley, whose office prosecuted Goodwin, denied that pressure from the victim’s family led them to pursue first-degree murder charges. But he said he is motivated in such cases by concern that a defendant found not guilty by reason of insanity may eventually be released from a hospital without court supervision. “If the defendant is found not guilty by reason of insanity and goes on to hurt someone, that’s very, very frightening to me,” Conley said. Conley’s prosecutors are haunted by the memory of Oscar Rosa, who was 14 in 2001 when he savagely beat an elderly man in South Boston. Doctors repeatedly found Rosa incompetent to stand trial, and after at least two years in juvenile custody, the charges were dismissed. In 2006, Rosa stabbed a security guard who had thrown him and his friends out of a dance club on Lansdowne Street for acting rowdy. The guard died two weeks later. A jury later convicted Rosa of second-degree murder. Still, such instances are extremely uncommon. 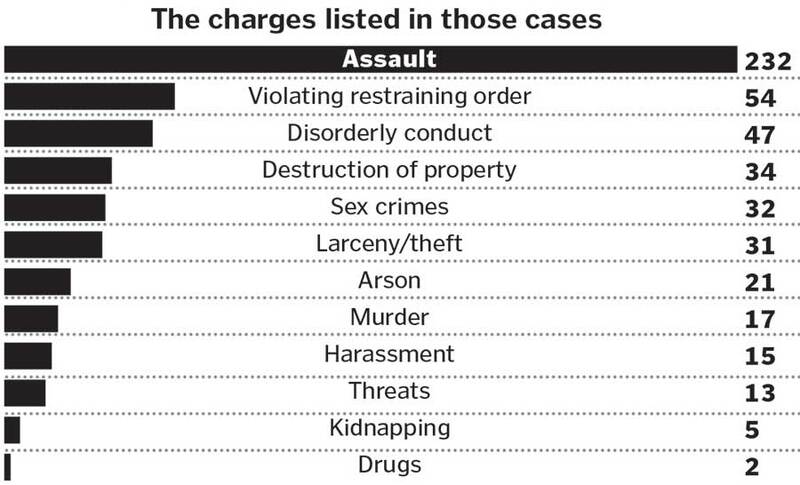 Of the 11 district attorneys surveyed by the Globe, eight could not cite one similar case. Two district attorneys did not respond. Most defendants found not guilty of murder by reason of insanity spend decades, if not their entire lives, in a locked institution. Only four of the 14 defendants who successfully pleaded insanity to murder between 2005 to 2015 have been released, all of them women. The others are still being held at Bridgewater State Hospital or a state psychiatric hospital. Last fall, the state’s highest court began instructing judges to tell juries that defendants found not guilty by reason of insanity can be held for the rest of their lives — information that some believe could help more juries accept an insanity defense. Two psychiatrists argued that Jahvon Goodwin, center, was not in control of his actions when he killed Rashad Lesley-Barnes, a stranger. The jury found him guilty anyway. But those instructions had not yet been issued at the close of Jahvon Goodwin’s murder trial in June 2015. In fact, the judge, Richard Welch, refused to let the defense tell the jury Goodwin could be hospitalized indefinitely. At the time of the killing, Goodwin had been undergoing treatment for schizophrenia at Massachusetts General Hospital but had complained that his medication made him lethargic and told doctors he had stopped taking it. Doctors told him to call the hospital if he was in crisis. After his arrest, Suffolk prosecutors hired Dr. Martin Kelly, a forensic psychiatrist with more than 40 years in the field, to examine Goodwin. Usually, Kelly’s opinions support the state’s position in murder cases: that defendants were criminally responsible for violence they caused. This time, Kelly concluded the symptoms of Goodwin’s schizophrenia were so acute on the day of the killing that he could not control his actions. Prosecutors, who paid Kelly $8,000 for his assessment, went ahead with the maximum charges anyway. Goodwin’s lawyer, Robert Wheeler, knew the insanity defense was a long shot, but he had one advantage: Kelly had agreed to testify for the defense. A second forensic psychiatrist also agreed to testify that Goodwin was so psychotic at the time of the killing, he could not control himself. The prosecution’s case relied heavily on surveillance video that showed Goodwin waiting until he was on the street, where he could escape, to attack Lesley-Barnes. After the stabbing, Goodwin quickly shed his shirt on the street, before fleeing. Both signs of self-awareness and of a calculated crime, prosecutors argued. The jury deliberated for a day and a half before coming back with a verdict: guilty of murder in the second degree. Welch sentenced Goodwin to life in prison with a chance of parole after 20 years. The juror interviewed by the Globe recalled how other jurors dismissed the medical opinions, believing Kelly and Saleh were “retained by the defense.” Welch wouldn’t let Wheeler tell jurors that Kelly had originally been hired by prosecutors. The juror ultimately voted to convict Goodwin after being swayed by the prosecution’s closing argument. Lesley-Barnes’s mother, Pauline Barnes, said she was relieved jurors rejected the medical testimony. After his conviction, Goodwin was sent to Bridgewater State Hospital. He would probably have been sent there even if he had been found not guilty, Wheeler acknowledged, and perhaps confined for good. But at least his freedom, or want of it, would have been dictated by his mental health and not the length of his sentence. Debra Silvestri had watched the judge send one defendant after another to jail for substance abuse. She feared she would be next. Read “A suicide in the courtroom” now.